Charlie Mathi, a diploma holder in mechanical engineering, is a native of Tirunelveli, Tamilnadu. He has been putting up a handicraft stall for the past 7 years on the occasion of Amritavarsham. Being a diploma holder, why has he resorted to this handicraft selling? He says “I am a diploma holder, my villagers have always been discouraging me from making handicrafts. They mock me for not working in a field in accordance with my studies and such reactions from people make my parents feel embarrassed as well. However, my parents stood by my side (as they always do, in other issues too) and said that I was doing something that other villagers couldn’t do, so they were jealous of me. But even then I couldn’t continue to stay there and do this business. I left my village and came to Kayamkulam to meet Rajvalsan a friend of mine. He suggested to meet Amma. I came for Amma’s darshan and opened up to to her about my problems in my hometown and she said that if I kept running away from my problems fearing them, I would never be able to overcome them. I then made a decision to stick to my passion and live with my parents in my hometown. ”He returned to Tirunelveli and comes to Kayamkulam only during the birthday festive season. 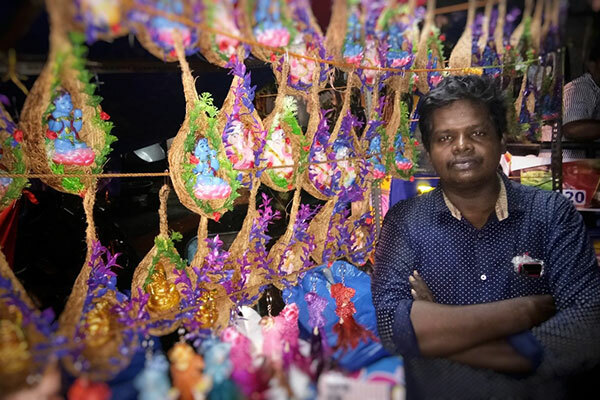 He makes idols of Lord Krishna, Ganapathy and Saraswathy in coconut shells and sells them for a price of Rs.60 each. “My parents are happy and I have now found a way to live my life without giving up my passion” says Charlie. Needless to say, he is happy. Previous Post Behind those glittering bangles….